We have arranged for PowerBlock to send a free Poster Pack, Interactive CD-Rom and Fitness & Nutrition Journal (an $82 value) with the purchase of any PowerBlock products through our PowerBlock links below. Well first, as a Certified Personal Trainer and Fitness Coach, I am always looking for the best available fitness equipment options for my personal training clients. 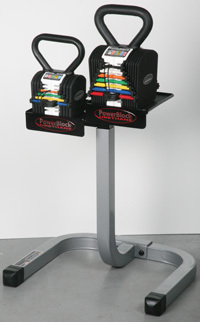 PowerBlock Dumbbells are first of all Completely Balanced. This is incredibly important with my clients to find a dumbbell that really provides them stability throughout their exercise movements. They are the heaviest, most compact and easiest to use quick change dumbbell. When designing a fitness plan for one of my fitness clients, Flexibility, space and ease of use really are key components that I look for in fitness equipment and once again, PowerBlock Dumbbells deliver on these key benefits. 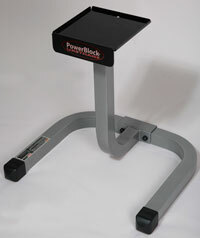 PowerBlock is the only dumbbell system that can expand to meet your fitness strength needs. 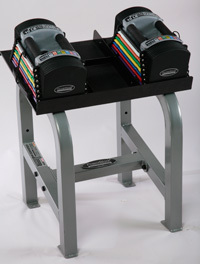 Yes, Once again PowerBlock Dumbbells provide the most expandable dumbbell weight system in the industry. Start with a 50 pound Set and Expand to 90 pounds and then expand again to 130 pounds. They Grow as you Grow!! When I design a fitness plan around my clients fitness goals, I always think about efficiency and effectiveness and PowerBlock Dumbbells are the perfect solution for my fitness clients. Dumbbells by far are the most versatile and effective exercise tool ever developed for strength training. Quick Change system - Fast Efficient Training Time! The U-33 Stage I Set has a weight range of 3-21 lbs per hand and will replace 16 pairs of dumbbells or 352 lbs of free weights. Increments achieved with the U-33 Stage II Set are; 1, 3, 4, 5, 7, 8, 9, 11, 12, 13, 15, 16, 17, 19, 20, and 21lbs per hand. 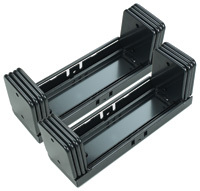 Dimensions are; 10.5"L x 5.5" H x 5.5" W. PowerBlock U-33 Stage I Set ships in 2 boxes. The U-33 Stage II Set has a weight range of 3-33 lbs per hand and will replace 25 pairs of dumbbells or 866 lbs of free weights. Increments achieved with the U-33 Stage II Set are; 1, 3, 4, 5, 7, 8, 9, 11, 12, 13, 15, 16, 17, 19, 20, 21, 23, 24, 25, 27, 28, 29, 31, 32 and 33 lbs per hand. 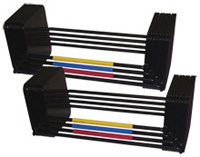 Value of the U-33 Stage II Set at $298/pair - cost per lb (replaces 864 lbs) is 40� per lb. Compare to Urethane coated dumbbells at $2.99 lb costing $2589.34. Dimensions are; 13.25" L x 5.5" H x 5.5" W. Ships in 4 boxes. The U-50 Set has a weight range of 5-50lbs per hand, gives every 2.5 lb increment, and replaces 20 pairs of dumbbells in the space of 1 pair. The U-50 Set replaces the equivalent of 1049 lbs of free weights.The weight increments achieved with the U-50 Set Are; 2.5, 5, 7.5, 10, 12.5, 15, 17.5, 20, 22.5, 25, 27.5, 30, 32.5, 35, 37.5, 40, 42.5, 45, 47.5 and 50 lbs per hand. Value of the U-50 at $379/pair - cost per lb (replaces 1049 lbs) is 36� per lb. Compare to Urethane coated dumbbells at $2.99 lb costing $3136.51. Dimensions are; 13"L x 7.25" H x 7" W. Ships in 2 boxes. The U-90 Stage I Set is expandable later to 90 lbs per hand with the U-90 Stage II Kit, and again to 125 lbs per hand with the U-90 Stage III Kit. The U-90 Stage I Set has a weight range of 5-50 lbs per hand and will replace 16 pairs of dumbbells or 825 lbs of free weights. Increments achieved with the U-50 Set are; 2.5, 5, 7.5, 10,15, 17.5, 20 25, 27.5, 30, 35, 37.5, 40, 45, 47.5 and 50 lbs per hand. The dimensions of U-90 Stage I Set are; 12.5" L x 7" W x 7.25" H. Ships in 2 boxes. The U-90 Stage II Set is expandable later to 125 lbs per hand with the U-90 Stage III Kit. The U-90 Stage II Set has a weight range of 5-90 lbs per hand and will replace 28 pairs of dumbbells or 2565 lbs of free weights. Increments achieved with the U-90 Set are; 2.5, 5, 7.5, 10,15, 17.5, 20 25, 27.5, 30, 35, 37.5, 40, 45, 47.5, 50, 55, 57.5, 60, 65, 67.5, 70, 75, 77.5, 80, 85, 87.5 and 90 lbs per hand. The dimensions of U-90 Stage I I Set are; 17" L x 7" W x 7.25" H. Ships in 4 boxes. The U-33 Stage II Kit will expand the U-33 Stage I Set from 3-21 lbs per hand to 3-33 lbs per hand. The U-33 Set will then replace 25 pairs of dumbbells, or 866 lbs of free weights. Increments achieved with the U-33 Stage II Set are; 1, 3, 4, 5, 7, 8, 9, 11, 12, 13, 15, 16, 17, 19, 20, 21, 23 ,24, 25, 27, 28, 29, 31, 32 and 33 lbs per hand. The dimensions of U-33 Stage II Kit are; 13.25" L x 5.5" W x 5.5" H. Ships in 2 boxes. The U-90 Stage II Kit will expand the U-90 Stage I Set from 50 lbs per hand to 90 lbs per hand. 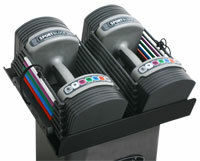 The U-90 Set will then replace 28 pairs of dumbbells, or 2565 lbs of free weights. Increments achieved with the U-90 Set are; 2.5, 5, 7.5, 10,15, 17.5, 20, 25, 27.5, 30, 35, 37.5, 40, 45, 47.5 ,50, 55, 57.5, 60, 65, 67.5, 70, 75, 77.5, 80, 85, 87.5 and 90 lbs per hand. The dimensions of U-90 Stage II Kit are; 17" L x 7" W x 7" H. Ships in 2 boxes. The U-90 Stage III Kit will expand the U-90 Stage II Set from 90 lbs per hand to 125 lbs per hand. 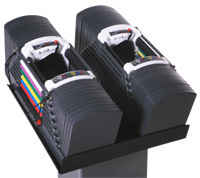 The U-90 Stage III Set will then replace 34 pairs of dumbbells, or 3930 lbs of free weights. Increments achieved with the U-90 Stage III Set are; 2.5, 5, 7.5, 10,15, 17.5, 20, 25, 27.5, 30, 35, 37.5, 40, 45, 47.5 ,50, 55, 57.5, 60, 65, 67.5, 70, 75, 77.5, 80, 85, 87.5 90, 105, 112.5, 115, 120, 122.5 and 125 lbs per hand. The U-90 Stage III Kit comes with 2 additional weight plates and a taller handle set for use with additional weight plates. The dimensions of U-90 Stage III Kit are; 20" L x 7" W x 8.5" H. Ships in 2 boxes. What if a dumbbell could also be a kettlebell...? That would be smart. 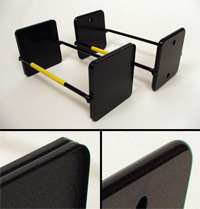 The KettleBlock Handle is available as a very inexpensive option exclusive to the Urethane Series. Simply replace your Urethane dumbbell handle with The optional KettleBlock Handle. The KettleBlock Handle when used with the U-90 Stage I Set will give you 15 kettlebells. When used with the U-90 Stage I Set, the KettleBlock Handle gives you the following kettlebell increments: 10, 12.5, 15, 20, 22.5, 25, 30, 32.5, 35, 40, 42.5, 45, 50, 52.5 and 55 lbs. The KettleBlock Handle empty is 10 lbs and the padded wrist supports are bigger than that on a dumbbell handle making it the most comfortable kettlebell you've ever used. You use the adder weights from your U-90 Set to make the handle 12.5 or 15 lbs. The KettleBlock Handle is just another reason why the Urethane Series is the Evolution of the PowerBlock, and why we say; The World's Best Dumbbell just got better. What is a KettleBlock? A KettleBlock is a selectorized Urethane kettlebell. A KettleBlock is to a kettlebell what a PowerBlock is to a dumbbell...SMART. Compact. Space Saving. Portable. Cost effective. Easy to use. Quick to change weight. The KettleBlock 20 replaces 5 Urethane kettlebells in 1/5th the space replacing 61 lbs of kettlebells at a fraction of the cost. The KettleBlock 20 gives you these kettlebell increments: 5, 8, 12, 16 and 20. The KettleBlock 20 replaces 5 kettlebells in the space of 1. The KettleBlock 40 replaces 8 Urethane kettlebells in 1/8th the space replacing 186 lbs of kettlebells at a fraction of the cost. You could expect to pay about double that for traditional kettlebells and have 8 kettlebells to store instead of 1 KettleBlock. The KettleBlock 40 gives you these kettlebell increments: 8, 12, 16, 20, 25, 30, 35, 40. The KettleBlock 40 replaces 8 kettlebells in the space of 1. The KettleBlock 55 lb Conversion Kit will allow you to expand the KettleBlock 40 to 55 lbs. The KettleBlock 55 Conversion Kit gives you these additional kettlebell increments: 45 and 55 lbs. This stand is specifically for the KettleBlock 20 and KettleBlock 40. It has a foot print of 21" x 23" and a height of 23". 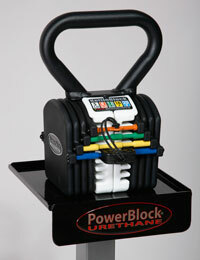 Has PowerBlock Urethane logo. It provides a convenient, attractive storage/racking system for your KettleBlock. 21 lbs. A neat & compact way to store and use your KettleBlock�s. KettleBlocks in the same floor space as with one Stand. on the same Stand (Stand will hold two KettleBlock� 40�s). of the KettleBlock and your ready to go. double duty as a Wrist Guard/Sweat Band. 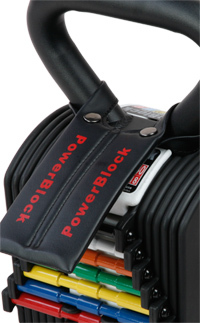 The Sport Series is the third generation of PowerBlocks new in June of 2008. 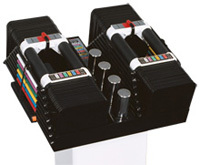 The Sport Series consists of 4 models of PowerBlocks with unique differences in both form & function. As far as form goes, the dramatic changes would be the Gray color of the steel weight plates vs. the black weight plates of other PowerBlock models and the rounded shaped top of the weight plates offering a stylish look. As far as function differences, the Sport Series has tapered handles, double tethered selector pins (not on the Sport 2.4) , the wrist supports are of a more open design offering a larger handle cavity and the dial locks are recessed into the handle. The Sport 5.0 equals/replaces 10 pairs of dumbbells or 550 lbs of free weights. The weight range for the 5.0 is 5-50 lbs per hand in 5 lb increments. Weight increments achieved are; 5, 10, 15, 20, 25, 30, 35, 40, 45 and 50 lbs per hand. 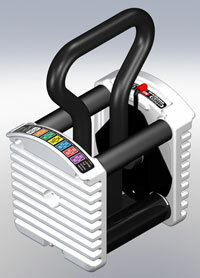 The 5.0 can be further expanded to 65 lbs per hand with the optional Sport 5.0 Set 20 lb cores. Sport 5.0 value at $299/set- cost per lb on the Sport 5.0 (replaces 550 lbs) is 54¢. Compare to hex heads at 99¢ lb costing $544. 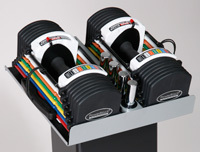 The Sport 5.5 equals/replaces 22 pairs of dumbbells or 1265 lbs of free weights. The weight range for the 5.5 is 2.5-55 lbs per hand in 2.5 lb increments. Weight increments achieved with the Sport 5.5 are; 2.5, 5, 7.5, 10, 12.5, 15, 17.5, 20, 22.5, 25, 27.5, 30, 32.5, 35, 37.5, 40, 42.5, 45, 47.5, 50, 52.5 and 55 lbs per hand. Sport 5.5 value at $349/set- cost per lb on the Sport 5.5 (replaces 1265 lbs) is 26¢. Compare to hex heads at 99¢ lb costing $1252. The Sport 9.0 Set is a component based Set that can expand in weight to meet the needs of the user. You can start with the Sport 9.0 Stage I, 5-50 lb set. This set can then be expanded later to 90 lbs per hand using the Stage II Kit. This 90 lb Sport 9.0 Set can then be further expanded with the Stage III Kit to 130 lbs per hand. The Sport 9.0 Set (or any PowerBlock for that matter) is the most compact dumbbell available. The small size of the PowerBlock keeps the weight concentrated closer to your hand making the dumbbell easier to control and balance. Image at left shows the dramatic difference in compactness of the Sport 9.0 Set compared to other dumbbells on the market. The dumbbells at left are all 30 lb dumbbells.The Sport 9.0 will not inhibit exercise movements such as seated dumbbell curls or even flat bench presses where you want your hands directly above your shoulders in the up position. The Sport 9.0 Stage I will replace 16 pairs of dumbbells or 825 lbs of free weights. The weight range for the 9.0 Stage I is .5-50 lbs per hand. Increments achieved with the Sport 9.0 Stage I are; 2.5, 5, 7.5, 10,15, 17.5, 20 25, 27.5, 30, 35, 37.5, 40, 45, 47.5 and 50 lbs per hand. The Sport 9.0 can be further expanded to 90 lbs per hand with the Stage II Kit, and again to 130 lbs per hand with the Stage III Kit.The dimensions of 50 lb Sport 9.0 are; 12"L x6.5" W x 6.5" H. Ships in 2 boxes. Sport 9.0 Stage I value at $349/set- cost per lb on the Sport 9.0 (replaces 825 lbs) is 43¢. Compare to hex heads at 99¢ lb costing $816. 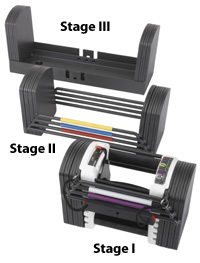 The Sport 9.0 expanded to 130 lbs with Stage III Kit will replace 37 pairs of dumbbells or 4,820 lbs of free weights. Increments achieved with the Sport 9.0 Stage III are; 2.5, 5, 7.5, 10,15, 17.5, 20 25, 27.5, 30, 35, 37.5, 40, 45, 47.5, 50, 55, 57.5, 60, 65, 67.5, 70, 75, 77.5, 80, 87.5, 90, 100, 102.5, 105, 110, 112.5, 115, 125, 127.5 and 130 lbs per hand. The dimensions of 130 lb Sport 9.0 are; 19"L x6.5" W x 6.5" H. Ships in 6 boxes. Sport 9.0 Stage III value at $887/set- cost per lb on the Sport 9.0 Stage III (replaces 4,820 lbs) is 19¢. Compare to hex heads at 99¢ lb costing $4771. The Sport 5.0 Set can be expanded from 50 lbs to 65 lbs with the Sport 5.0 20 lb Cores. The Sport 9.0 Stage I 50 lb Set can be expanded from 50 lbs to 90 lbs with the Sport 9.0 Stage II Kit. Simply put the Sport 9.0 50 lb Set weight plates inside the Sport 9.0 Stage II weight plates and you're ready to go. Stage II Kit dimensions: 16" L x 6.5" W x 6.5" H. Weight 40 lbs each. Ships in 2 boxes. The Sport 9.0 Stage III Kit expands the 90 lb Sport 9.0 Stage II Set to 130 lbs per hand. Stage III Kit dimensions: 19" L x 6.5" W x 6.5" H. Weight 40 lbs each. Ships in 2 boxes. 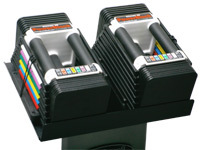 The Classic Series is the second generation of PowerBlock dumbbells and feature black powder coat painted weight plates in the traditional square shape. 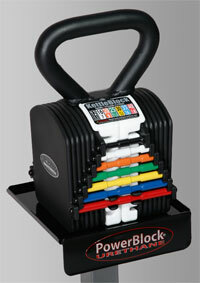 The Classic PowerBlocks offer a great great value and some different weight ranges and price points. 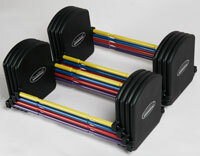 This set adjusts from 5-45 lbs in 5 lb increments (5, 10, 15, 20, 25, 30, 35, 40, 45 lbs) in each hand. This set has a maximum weight of 45 lbs per hand. 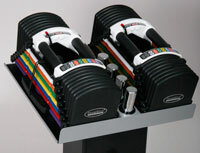 The Classic 45 replaces 9 pair or 18 fixed dumbbells that would have a combined weight of 450 lbs. (Shown on optional Stand) Also available optional Classic Bar to allow barbell exercises with your Classic 45 Set. Classic 45 value at $279/set- cost per lb on the Classic 45 (replaces 450 lbs) is 62¢. Compare to hex heads at 99¢ lb costing $445.50. The dimensions of the Classic 45 are; 12"L x6" W x 6" H. Ships in 2 boxes. The Personal Trainer Set equals/replaces 20 pairs of dumbbells or 1050 lbs of free weights. The weight range for the Personal Trainer Set is 2.5-50 lbs per hand in 2.5 lb increments. Weight increments achieved with the Personal Trainer Set are; 2.5, 5, 7.5, 10, 12.5, 15, 17.5, 20, 22.5, 25, 27.5, 30, 32.5, 35, 37.5, 40, 42.5, 45, 47.5, and 50 lbs per hand. Personal Trainer Set value at $329/set- cost per lb on the Personal Trainer Set (replaces 1050 lbs) is 33¢. Compare to hex heads at 99¢ lb costing $1039.50. 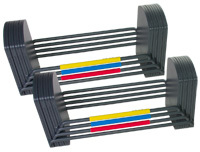 The Elite Set 5-50 base set comes with plates 1-4, and has a weight range of 5-50 lbs per hand. The Elite Set 5-50 equals/replaces 16 pairs of dumbbells or 825 lbs of free weights in the space of just 1 pair (50 lb dumbbell is just 11 3/4" long). This set is expandable using the add-on kits. The 40 lb Elite Add-On Kit, plates 5-8, would take the set from a maximum weight of 50 to 90 lbs in each hand. The Elite Big Block Kit, plates 5-11, would take the 5-50 set from a maximum weight of 50 to 130 lbs in each hand. The dimensions of the Elite 50 are; 12"L x6" W x 6" H. Ships in 2 boxes. Made in USA. The Elite 5-90 set comes with plates 1-8, and has a weight range of 5-90 lbs per hand. The Elite 5-90 lb equals/replaces 28 pairs of dumbbells, or 2565 lbs of free weights while taking up the space of just 1 pair (90 lb dumbbell is just 16" in length) This set is expandable to 130 lbs per hand using the 8-11 Elite Big Block Kit. The dimensions of the Elite 90 are; 16"L x 6" W x 6" H. Ships in 4 boxes. Made in USA. The Elite Set 5-130 set comes with plates 1-11, and ahas a weight range of 5-130 lbs per hand. The Elite Set 5-130 lb equals/replaces 37 pairs of dumbbells, or 4820 lbs of free weights while taking up the space of just 1 pair. Increments achieved with the Elite 130 are; 2.5, 5, 7.5, 10,15, 17.5, 20 25, 27.5, 30, 35, 37.5, 40, 45, 47.5, 50, 55, 57.5, 60, 65, 67.5, 70, 75, 77.5, 80, 87.5, 90, 92.5, 100, 102.5, 105, 112.5, 115, 117.5, 125, 127.5 and 130 lbs per hand. The dimensions of the Elite 130 are; 19"L x 6" W x 6" H. Ships in 6 boxes. Made in USA. 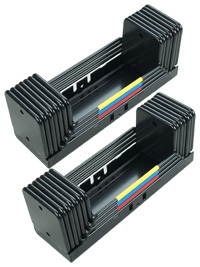 Are you ordering an Add On Kit for a set of PowerBlocks you purchased before September 2005? Please make sure you're purchasing the correct kit for your PowerBlocks. Prior to Sept 2005 our product was called the Pro set. This set was characterized by two holes in every plate. In the photograph the Pro set is on the right side. The other weight plate shown is a Classic Elite weight plate. 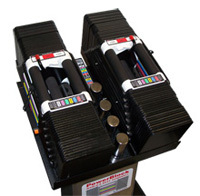 The Elite set is manufactured by welding two weight plates together. This kit can be used only with the Elite Set to bring the total weight in each hand up to 90 lbs per hand. The 90 lb Elite Set can be further expanded to 130 lbs, using the Elite 8-11 Big Block Kit. Made in USA. This kit allows you to expand the Elite set from 90 lbs in each hand to 130 lbs in each hand (ie, the user would already have the Elite 40 lb Add-On Kit.) Made in USA. This kit can be used only with the Elite set to bring the total weight from 50 lbs to 130 lbs in each hand. Made in USA. This kit can be used only with the Pro Set to bring the total weight in each hand up to 90 lbs per hand (with Aluminum handles, 85 lb with Rexan Handles). The 90 lb Pro Set can be further expanded to 130 lbs, using the Pro 8-11 Kit. Made in USA. This kit allows you to expand the Pro set from 90 lbs (Aluminum Handles, 85 lbs with Rexan Handles) in each hand to 130 lbs in each hand ( the user would already have the Pro 40 lb Add-On Kit plates 5-8.) Made in USA. This kit can be used only with the Pro set to bring the total weight from 50 lbs (Aluminum Handle Set) to 130 lbs in each hand. Made in USA. The U-90 Club Set has a weight range of 5-90 lbs per hand and will replace 18 pairs of dumbbells or 1710 lbs of free weights. Increments achieved with the U-90 Club Set are; 5, 10, 15, 20, 25, 30, 35, 40, 45, 50, 55, 60, 65, 70, 75, 80,and 90 lbs per hand. Dimensions are; 17"L x 7.25" H x 7" W. PowerBlock U-90 Club Set ships assembled in 5 boxes. The U-50 Club Set has a weight range of 10-50 lbs per hand and will replace 9 pairs of dumbbells or 100% lbs of free weights. Increments achieved with the U-50 Club Set are; 10, 15, 20, 25, 30, 35, 40, 45, and 50 lbs per hand. 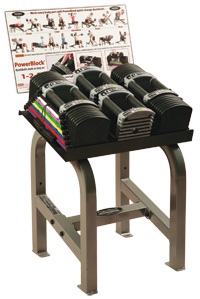 Dimensions are; 13.25"L x 7.25" H x 7" W. PowerBlock U-50 Club Set ships assembled in 3 boxes. Color coded weight chart and corresponding colored side rails make weight changes quick and easy with Club 50 Set. Club 50 Set shown with optional KettleBlock Handle. The KettleBlock Handle will allow the user to use the Club 50 weight stack to get 9 kettlebell incremnts. KettleBlock Handle will work with Club 50 or Club 90 models. 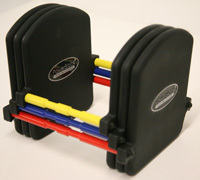 Bottom line...PowerBlocks are perfectly balanced. They are the heaviest, most compact and easiest to use quick change dumbbell. 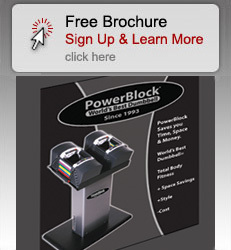 PowerBlock is the only dumbbell system that can expand to meet your strength needs. Start with a 50 lb set, expand to 90 lbs, expand again to 130 lbs. Dumbbells are the most versatile and effective exercise tool ever developed for strength training. Now you can have rapid access to a whole rack of dumbbells at home in the space of just 1 pair, and at a fraction of the price of conventional dumbbells.